Gold closed at $883.20 in New York yesterday and was up $13.30 and silver closed at $1 7.24 up 67 cents. Gold traded in a range between $880 and $890 in Asia n and in European trading this morning prior to selling off at the open on the NYMEX . With oil selling off and the dollar stronger versus the euro today, gold has come under pressure. But the inflation genie is well and truly out of the bottle and central banks internationally are in an extremely difficult situation. Unfortunately, present macroeconomic conditions look set to worsen (possibly considerably) in the coming months before they get better. Stagflation is increasing by the day and this will result in gold outperforming other asset classes in the coming months as it did in the 1970's. Britain's inflation rate rose more than expected in May (+3.3%) to its highest since the Labour government came to power in 1997 and the Bank of England will now have to explain in a letter how it will bring prices back under control. Bank of England Governor, Mervyn King warned that inflation was here to stay and will accelerate and exceed 4% in the coming months. Investors are losing faith in the central bank's, including the Bank of England, ability to keep inflation low. Thus, despite a dire need for lower interest rates due to a risk of a property crash and serious recession, central banks seem to be talking tough on inflation while actually adopting a 'wait and see' approach. At 5 percent, Britain's interest rate is the highest in the Group of Seven industrialized nations. U.K. inflation is also lower, at 3 percent in April, compared with 3.9 percent in the U.S. and 3.6 percent in May for the euro region. Britain, unlike the U.S., does not have negative real interest rates and thus has more room for manoeuvre than the beleaguered Ben Bernanke. The gold to oil ratio remains near all time multi decade lows and clearly shows gold is undervalued vis a vis the lifeblood of the global economy - black gold or oil. With gold at $880 per ounce and oil at $135 per barrel, the gold/ oil ratio is now at 6.5. The average in the last 40 years is 15. Oil has well surpassed it's inflation adjusted 1980 high of $104 a barrel ( the nominal high in 1980 was $39.50 a barrel which equals $103.76 in today's money). Gold continues to play laggard as it often does but will outperform oil in the later stages of the bull market as recession and demand destruction leads to a fall in oil prices but leads to safe haven buying of gold. 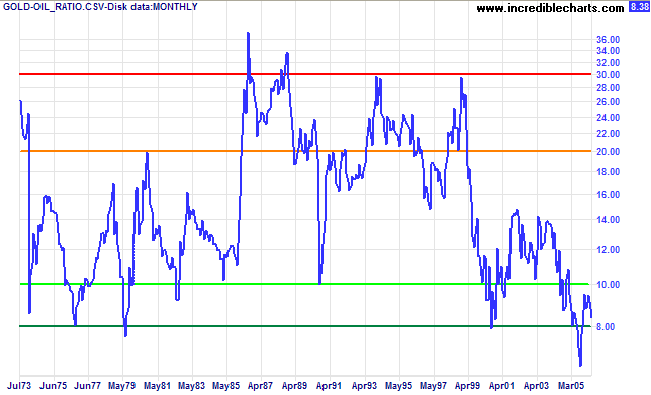 Gold's inflation adjusted high of $2,200 per ounce remains a very likely price target in the next 3 to 5 years. I nvestors await economic figures on inflation at the wholesale level and the housing market. Wall Street is also expecting a report on industrial production. An hour before the opening bell investors will be looking for figures to show that the producer price index, which measures wholesale and raw material prices, rose in May. The Labour Department's index will likely draw particular attention this month because investors are looking for signs of whether increased costs for a range of commodities, including oil, will force companies to pass along higher costs to customers. Silver is trading at $1 6.90 /1 7.00 per ounce (1 3 30 GMT). Platinum is trading at $20 3 5 /20 4 5 per ounce (1 3 30GMT). Palladium is trading at $4 56 /4 60 per ounce (1 4 30 GMT).